Here at GSCSNJ we've been devastated to learn about the tornadoes that hit the towns of our sister Girl Scouts in Oklahoma. Like many of you, we have been wondering what is the best way to help. 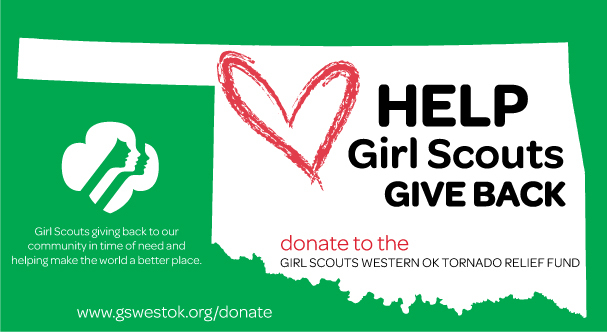 The Girl Scouts Western Oklahoma have set up a tornado relief fund to help support Girl Scouts and their families. While we're still assessing the damage, we know that the need will be great. In order to support our girls and their families, we have created the Girl Scouts Western Oklahoma Tornado Relief Fund that will help get troops up and running; replace uniform components; Journey and Guide books; provide scholarships for program and camp participation; and ensure the safety of girls at our program properties. You can text the word GIRLS to 20222 to make a $10 donation via your cell phone bill. A one-time donation of $10.00 will be added to your mobile phone bill or deducted from your prepaid balance. Message and data rates apply. T&C available at www.hmgf.org/t. In addition, you can assist our efforts by making a donation to Girl Scouts Western Oklahoma Tornado Fund at www.gswestok.org. Monetary donations can also be made at any of our council offices. Our local United Way has activated a disaster relief fund so individuals may contribute to the May tornados relief and recovery efforts. Visit www.unitedwayokc.org or call 405.523.3597. Donations will be distributed without administrative fees to partner agencies working on tornado relief efforts. We want our sister Girl Scouts to know that they are in our thoughts. We have not forgotten about them! Girls, here's a good opportunity to help make the world a better place. 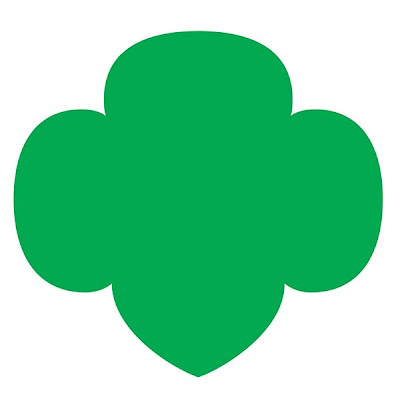 Below is our trefoil to inspire you to create something special for a Girl Scout sister in need. Dress it up, share your favorite quote, be creative! She will love that you simply care about her. We love our Girl Scout sisters!